It is believed the roots of the family go back to the collapse of the Roman empire with the migration of peoples from the north of Europe to present day Italy and decended from the family Moliex that settled in Lombardy. The name Moliex is Lombardian, and is suggested to be derived from the town of Mogilev in European Russia, on the River Dniester. Mogilev was in a territory long occupied by a people, who are said to have migrated, as the result of a famine, from Norway in the first century A.D. They left Denmark in 378 and eventually established themselves in northern Italy in A.D. 568, having conquered a kingdom there that had Pavia as its capital. The first mention of the family is found in records at Milan, and the following genealogy of the Lombardian Moliex or Molier was obtained from a 'Conservasi nel ma gros, teatro della Nobilitta del Mondo, il sequenta framenta di Alboro Genealogica,' transcribed by Signor Vallardi, an heraldic official of Milan, for James Keir Moilliet in March, 1889. He commenced this research after finding a tomb in the crypt of Milan Cathedral that bore the family name and coat of arms. The fact of a tomb existing there shows that the family had been of some stature. The genealogy came from Milan, but the family lived at Claremont Ferrand, in the Narbonnese, or Pay de Dome, in France, where they 'had large lands'. Two sons of Rambaldo I, Riccardo and Giovanni II, fought in the 7th Crusade with the King of Navarre, under St. Louis of France, and during this campaign they were granted new arms -- a Swan and 3 Stars, now borne by the family. 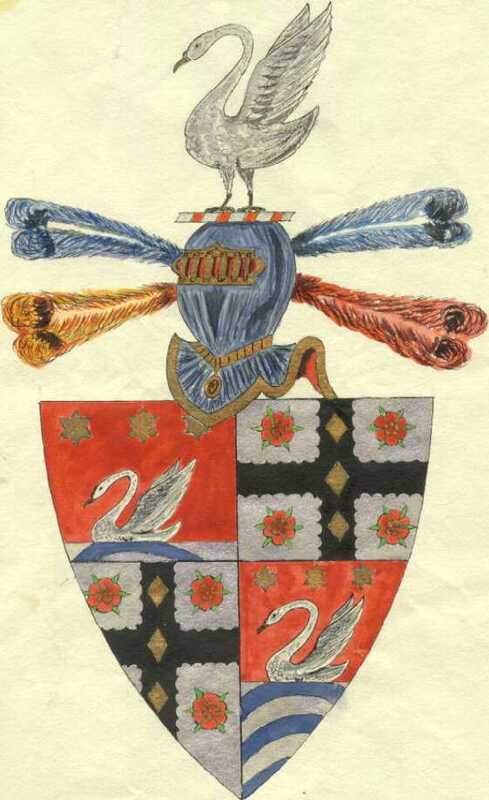 This change of arms is mentioned, and dated 1270, in a genuine and original manuscript collection belonging in 1822, to the noble house of Bonacina. In about 1535, on the death of Francesco Sforza, the Milanese were seized by the Emporer Charles V who created an Imperial fief, and granted this to his son Philip. As a result, many of the old territorial families had to leave, their estates were confiscated, and records destroyed. Also soon after a religious persecution broke out under Carlo Borromeo, who when only twenty-one years old was made Bishop of Milan and Govenor by his uncle, Pope Pius IV, in l559. The genealogy here recorded is all that is known of the Lombardian Moliex. All Glaremont Ferrand records appear to have perished in the French Revolution. During this unsettled period, the family Moliex or Molier entirely disappeared from Lombardy, and so did this coat of a Swan and 3 Stars. Also during this period a family calling itself Moliex or Molier, and bearing arms of a Swan and 3 Stars appears first in France and soon afterwards in the Protestant state of Geneva. The history of the family from the time of Michel of Arrache, b. 1510, is very clearly established by Genevese records of baptisms, marriages, and deaths, up to the present time. But the direct connection between the Lombardian and Genevese Moliex is lost. Michel I may have been a grandson of the sesto Riccardo (v. 1360) who was a monk but when his elder brother died without descendents he was dispensed from his vows, married a lady of noble birth, and had a large family. In addition a Michel Moliex is found in Geneva as early as 1460. The closeness of names and the similarity of the coat of arms suggests some connection between the Lombardians and the Genevese. However the dissimilarity between the Christian names in the two families might suggest the connection was slight or indirect though there may be some simple explanation of this, such as a sudden change of religion and a desire to break with the past. It is worth noting that the form of helmet that, according to Signor Vallardi accompanied both the old coats, was that reserved for the higher nobility. A recent doctoral thesis by Olivier Perroux at the University of Geneva, Department of History in 2003, researched the development of the middle class in Geneva and provides a picture of the interactions between families in Geneva in the 1800th and 1900th centuries. The thesis, Tradition, vocation et progrès : les élites bourgeoises de Genève (1814-1914), describes some of the family relationships between the Moilliet and Baumgartner families. In almost 30 pages of his 337 page thesis Mr. Perroux illustrates this by following the short life of Antoine Baumgartner who possibly succombed to the presure to succeed. He also identifies a Mr. Gem as partner in the Moilliet export business in Birmingham. This detail was previously unknown in family lore.
" ... A son of my sister, who is my godson, and is known by the name John-Lewis Moilliet is to deliver you these lines, and I hope will permit me to crave for him your kind protection, should he want it by the absence or some mishap of my worthy friend Mr. Sigismund Hoofsetter. I love the lad and I think he deserves it ... "
In his usual friendly and hospitable way, Matthew Boulton introduced the young man to his circle of friends, and so Jean-Louis Moilliet met James Keir F.R.S. (.pdf file),- and more importantly still, James Keir's only child, his daughter Amelia. Keir was a founder of the chemical industry - the inventor of the first fully synthetic process for making caustic soda and a promintent member of the 'Lunar Society of Birmingham'. The young Jean-Lewis settled in Birmingham where he became a merchant (and later a banker) dealing in export of Birmingham manufacture. He had previously arrived in London in 1786 but moved to Birmingham which was an important and rapidly expanding industrial area and had many commercial ties to Geneva. In 1801 Amelia Keir married Jean-Louis Moilliet at All Saint's Church, West Bromwich. Jean-Louis became a naturalised Briton, changed his name to John Lewis Moilliet (pronounced Moyliett - accent on the first syllable) and the young couple made their home for many years at Smethwick Grove. The new Moilliet family would be intertwined with the Darwins and the Galtons in later years. John-Lewis was by no means a penniless adverturer or refugee when arriving in Birmingham for his father had provided him with working capital of £10,000 (equivalent to well over $500,000 today) to establish the 'family name' in England. These financial resources would steadily increase with his many business endeavors. It is noted in Aris's Birmingham Gasette on January 3, 1803 an announcement that suggests he had bought out his partners, Dickson and Shore, and he would continue to, "carry on the business of merchants at #3 Newhall Street". John-Lewis continued his business, that would be referred to export/import today, with a succession of parners. He entered banking, The Birmingham and Warwichshire, in 1815 and his success is demonstrated by his swift rise from junior to senior partner and by 1840 the bank had become fully owned by his family. Sadly the economic collapse in the 1850s saw the bank later ammalgamate with other privately held banks to form Lloyds Bank. Soon after the Napolionic wars John-Lewis Moilliet bought the Chateau de L'Imeratrice at Pregny, on Lake Geneve near the city of Geneva. As its name implies it had belonged to Empress Josephine, Napoleon's first wife. According to the diaries of John-Lewis' wife Amelia it was the centre of social and business gatherings of English and Swiss notabilities. Many of the Swiss guests belonged to families connected to the Moilliets. A few of these were Jean-Charles-Leonard Sismondi the historian and writer, Pictet the chemist and Dr. and Mrs. Jane (Haldimand) Marcet, she being the author of "Conversations on Chemistry". Visitors from England were writer Maria Edgeworth (whose father was a member of the Lunar Society), Lady Davy (wife of the chemist - Sir Humphrey Davy) the Gibbons (Midland iron founderers) and Josiah Wedgewood. Amelia's diary also records the family's involvement in England in the anti-slavery movement noting the several public meetings they arranged with Sir William Wilberforce. Pregny remained in the family possession until the middle of the 1850s and then was sold apparently for financial reasons. Probably the same financial reality that forced the sale of the bank. In 1837 John-Lewis bought the Abberley Estate from the surviving daughter of Col. Henry Bromley. She was a cousin of his daughter-in-law Lucy Harriot (Galton) wife of son James. Lucy was the daughter of Samuel Tertius Galton and she was half cousin to Charles Darwin. Her brother was Sir Francis Galton, father of modern eugenics. John-Lewis became so captivated by the scenery around Abberley Hall that he decided to restore the house, called at the time Abberley Lodge, in the Italian style. He wished to retire there being now 67 years. He moved into the home in November 1844. However his tenure was only about 6 weeks when he died quite unexpectedly. Then on December 29th, 1845 Abberley Hall was ravished by fire. Many paintings and household valuables were lost. Mrs. Moilliet restored the structure and lived there until her death in 1857. We are James Keir and John Lewis Moilliet & we are Grandsons of dear Grandmama Moilliet whom we love so much & have been so very unhappy for her when her house, poor Abberley was on fire & we want to tell you that we have always loved you dearly because you are so good to everyone & the poor & to schools, & have too been the Queen of England, but we love you now a thousand times better since you have been so kind to Grandmama." "We know you my good kind Queen, though perhaps you have forgotten us but Mama took us to see you when you were going to Sir Robert Peel's about 5 years ago & we had new hats too on & you bowed and smiled at us so kindly. Please do you remember us, I hope you do for we do love you with all our hearts. We are twins so we both write & we hope you will be happy for ever & ever." "Goodbye my dear Queen. My sisters Amy & Adele love you too, but Tertius & baby Sophia are too little." "We send our love to you if it is not wrong or unrespectful. We are your affectionate Friends." "James Keir Moilliet, John Lewis Moilliet"
John-Lewis Moilliet died a wealthy man with an estate estimated to be around a £1,000,000, equivelent to over £70,000,000 today. His will listed a formidable collection of assets: Estates at Abberley, Studley, Tamworth, Skilts and Cattax totaling 3340 acres; a half share in an iron foundry in Spon Lane, West Bromwich; a half share of the 'foreign export business' in Newhall Street, Birmingham; shares in the Birmingham, Stratford and Dudley, and the Kennet and Avon Canals; estates at Pregny-Latour and Pesay, Geneva totalling 238 acres; estate of twelve houses in Camden and Pope Streets, Birmingham; and the value of the Bank - J.L. Moilliet and Sons. In modern times Ruth Moilliet, daughter of John Stewart (Jock) Moilliet and Janice Moilliet, has gain considerable recognition as a sculpter of works in steel inspired by flowers and seed heads. She has had several commissions of her facinating work. You can few her portfolio here. A few of the English Moilliets came out to the new world to make it on their own. Theodore Albert (1883 - 1935), son of James Keir Molliet and Sophia Harriet Finley, came to Canada in 1899 - first to Ontario and then to British Columbia where he was joined by his uncle Hyde Finley and eventually established Aveley Ranch, a large sheep ranch in the central interior of British Columbia. He was also joined by his brother John Lewis III ( 1882 - 1917). John (Jack) was an Oxford educated school master and came first to Vancouver B.C. where he taught for a time then later joined his brother on the ranch. During the Great War Jack joined the 78th Battalion of the Canadian Seaforth Regiment and went into the war in France. His regiment was in the successful battle for Vimy Ridge where he was wounded in the jaw by shrapnel. Jack was killed in action at the battle of Camp Plane, near Vimy, June 28, 1917. The battle for Vimy had taken place just a few months previously. Brothers Theodore Maynard and Erskine Lind came to Vancouver Island in British Columbia in the early 1900s. They were sons of Francis Albert Moilliet and Dora Maynard. Alexander Keir (1880 - 1921), son of James Keir and brother to Theodore Albert and John Lewis III, came to Canada and then the United States. He was a medical doctor and worked for mining companies and a British petroleum company in Mexico during his short career. He is buried at Tampico, Mexico. Alfred Moilliet (1858 - 1927), son of James and his second wife Jeannie Sayous, married Georgia Harrison Gowan in December 1881. Georgia (1862 - 1922) was born in Camden county, Georgia, U.S.A. Her mother was Elizabeth C. Evans who was born in Canada. According to the April 1881 census Alfred was living in the Rectory at Abberley with his half brother John Lewis who was the rector at St. Mary's Church. It also appears Alfred and Georgia spent some time at St. Lambert near Montreal but it is unknown how long he and his family were there. They had a daughter Katherine Laura (1882 - 1969). It is presumed the family returned to Geneva as both Georgia and Catherine died there. Georgia's father, George Harrison Gowan, is buried in Calgary, Alberta. Theodore Francis Moilliet (1920- ) came to Canada in 1947 following the war. He served in the British military during the was but did not see action. He came first to British Columbia where his cousins lived and soon found work at the Ocean Falls lumber and pulp facility. There he met Elizabeth Marriott. They married there but in the early 1950s moved to Toronto, Ontario where Betty had a ailing relative that needed care. Tom put his industrious experience to work as a machinist with A.V. Roe Canada, aircraft manufacturer. He arrived there in time to work on the CF-105 Avro Arrow. However in 1957 he could see that a change in government that would not see a 'master piece in aircraft engineering' through to complete development so he and Betty decided to move back to Western Canada where Tom join the Royal Canadian Air Force as a aircraft engine mechanic. He was stationed in Comox BC, Calgary and Edmonton AB, during his long career with the air force. He had a tour of duty in the Middle East during one of several Canadian peace keeping missions. Tom still lives in Medicine Hat Alberta. His lovely wife, Betty, has been deceased for a couple of years. There are a dozen or so families of Moilliets in France, many of them living near Paris. All seem to be related but it is unknown if this is a branch of the Swiss Moilliets, a small remnant of the family that is believed to have lived in Narbonnaise or a family with no connection at all to the Geneva Moilliets. Much of the history of families was destroyed during the French Revolution and the French Moilliets have not been able to trace their ancestry beyond the mid 1800s. There are also several families with the name Molliet (missing the 'i' in the first sylable of the name). This family originates from Cournillens in Switzerland. It is a small village between the towns of Morat and Freiburg. A Molliet family historian does not believe there is any connection to the Geneva Moilliets. John Lewis Moilliet (1803 - 1828) was the first son (second child) of Jean Louis Moilliet and Amelia Keir. His mother expressed concerns for him in her diary when he left for India in 1826. He served as a Captain in the 13th Light Dragoons. He died in India and is buried in the Protestant cemetary in Pondicherry. There is no record of his death however an historian of the Dragoons suggested John died during a cholera outbreak in the camps in 1828. Georges Moilliet (1827 - 1926) was raised in Switzerland, educated as a structural engineer and worked in bridge building in Japan. It is believed he died there and may have left some decendants. Gabriel Coryton Moilliet married Pamela Seton-Perry and lives in Cape Town South Africa.